This is certainly a first! 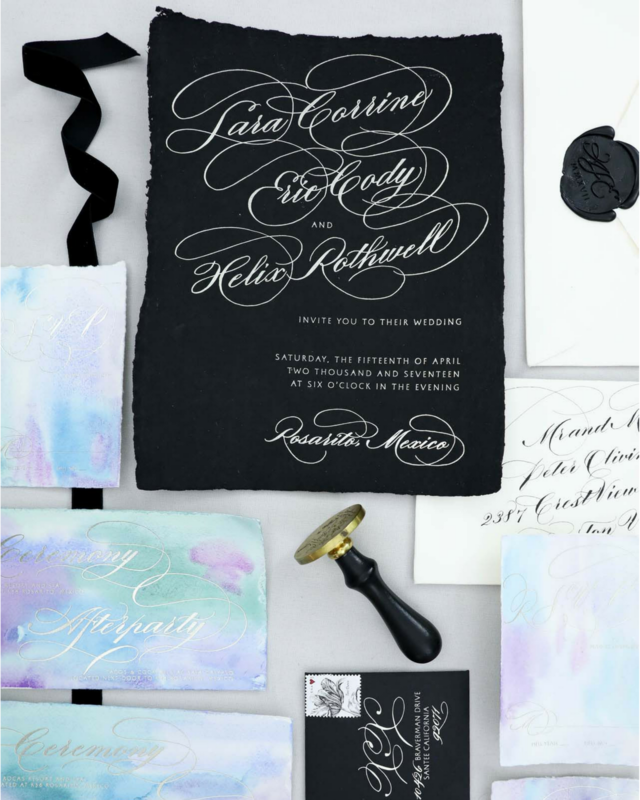 Dramatic black meets romantic mermaid wedding invitations, brought to us by Victoria of Design House of Moira. I never would have thought to pair rich black hues with subtle mermaid themed pastels, but it works OH SO WELL! What’s more, the flourished calligraphy and oversized wax seal are just the right amount of bold and beautiful for this over the top modern yet aquatic suite! What a fun and fresh look! From Victoria: We had an unusual combination of requests from this bride: she wanted black, dramatic, foil printing, handmade paper, a large scale wax seal, unusual size, and mermaid paper (yes, mermaid paper). Since size and handmade paper are the most difficult, we started there. We collaborated with Owl Post Calligraphy to create a custom order of black handmade paper in 8×11 inches. We wanted to be able to fold the invitation into thirds, so we paired it with inserts that were long and thin to fit inside the folded invitation. We choose a long envelope that opened with a flap rather than on the end of a #10 envelope. The mailing envelopes were a gorgeous handmade paper from Spain with a lacy and delicate deckled edge, while the reply envelope was a deep matte black.The wording on the invitation was also unusual. The wedding was hosted by the bride, groom and their son, whose names are listed together as a family. The additional inserts were all hand painted with watercolor in shades of blues, teals, and purples (mermaid colors!) on Italian paper with an extremely soft felt finish and delicate deckled edge. We selected the Italian paper for its cotton content and knowing that it wouldn’t buckle or warp with the watercolor. and piece of writing is in fact fruitful for me, keep up posting these posts.